Enjoy a supercharged engine, five-link independent rear suspension, TorqueFlite® Automatic transmission, and available collision warning with Active Braking®! Put your pedal to the metal with this muscle car’s low, lean profile and iconic scalloped bodyside. Over 45 years of muscle car heritage is available in 12 bright exterior colors! The Charger was designed with a High IQ. Enjoy features such as UConnect, Adaptive Cruise Control, Keyless Enter N’ Go®, Sport Mode, and more! Ask about our premium safety features that keep you and your passengers protected! Accidents and road hazards haven’t got anything on the Dodge Charger! So act like it. 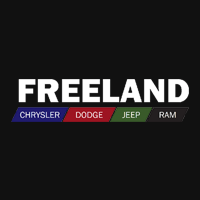 Find a customized option at Freeland!